For smooth sailing from beginning to end, equip your kitchen with the Grindmaster-Cecilware 250RH-2 Coffee Grinder. This item is 28.63 inches tall and 9 inches wide. 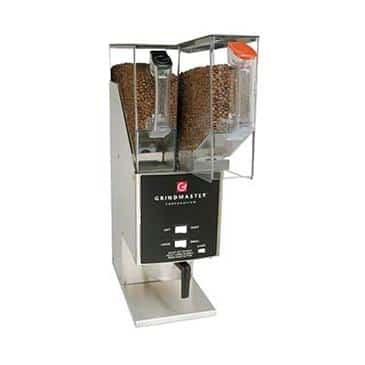 Grindmaster Corporation’s 250RH-2 and 250RH-3, removable hopper grinders, offer fully automatic portion control, positive bean flow and precise portioning at all weights with all coffees, even oily dark roast and flavored varieties. The clear, easy to handle, removable hoppers allow the operator to offer a variety of coffee flavors just by switching hoppers. The hopper’s bean exit port automatically closes when the hopper is removed from the grinder. These grinders offer precision grinding burrs for an accurate grind profile and fast grinding time every time to accommodate all brewing methods. Grindmaster Corporation’s world famous burrs are precision ground and lapped in pairs to provide an efficient uniform grind profile proven by RoTap. This results in the best profile and most consistent throw.